Rose Tree (Rhododendron) - A noble family of shrubs, so popular that they are often over-planted; that is to say, we see Rhododendrons in large and often lumpy masses in many country places where no planting of any other kind worth speaking of is carried out. In districts where they do well, the soil and climate being suitable, monotonous effects arise through their over-use, against which all who care for beautiful gardens should protest. The mild climate of England and generally our rather mild winters allow many more kinds to grow with us than on the Continent of Europe generally, or in North America. In severe winters some kinds are touched by frost even with us, and therefore we must be on our guard against planting other than the hardy varieties except in the south of England and Ireland. The hardy American species should be grown more in lowland valleys, as I find that they stand winters which kill R. ponticum. 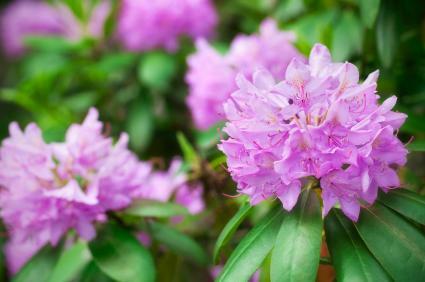 Nearly every variety of rhododendron is appropriate for gardening zones four through eight; some varieties can be planted in zones three and nine. The vast range in England over which the plant will grow well, alike in Ireland, England, and Scotland, makes the possession of the finest kinds most important. Among the numbers of kinds that have been raised by English nurserymen a good many poor, dull, or ugly in color have been sent out, and therefore it is important to get kinds good in color and to group and arrange them better than has hitherto been done; that is to say, not so much in flat areas and lumpy beds. A far better way is to break them up into bold and simple groups, holding the colors more together and not scattering them about in spotty mixtures. It is important to get plants from layers where possible, and not grafted plants, as these are apt to perish and their places be taken by the common stock, of which we have already far too much. Hitherto it has been very difficult to get layered plants; but some of our best nurserymen see the change suggested here is a good one, and are providing for it. It makes great difference in the end whether the kind has its own roots and is spread about into many plants, or is on some wretched stock on which it perishes. Rhododendrons are of free growth in almost any soils except those with lime in them. On many loamy soils free from lime the plants do perfectly well, although perhaps never so much at home as on a sandy peat. Over a large area of Ireland where the limestone prevails it is, I think, not worth trying to cultivate Rhododendrons, and it is always better to grow things that do best on ones own soil. Given a peaty or limeless soil, the difficulty is to prevent their growing so quickly as to smother each other. They are often too closely planted, and after a few years of rapid growth such plantations cannot show their beauty. It would be much better to plant all the choice kinds rather thinly. Where from previous thick planting the bushes are too close together, thin them promptly and severely, leaving the choicer kinds and the finest-formed bushes. In this way we get light and shade among the plants instead of allowing them to form one flat level mass. The excellent plan of placing Lilies and the other fine handsome hardy flowers among Rhododendrons and like shrubs tends to keep them more open and delightful in every way, their forms as well as flowers being better shown. The plants, forming generally close balls of earth, are more easily transplanted than most shrubs. This is often done in late spring and summer, as for the London flower-shows, where numbers of the finest kinds are brought in spring and taken away in summer. In the case of all choice and rare varieties remove the seed-vessels after flowering, thus saving the strength of the plants for future good growth and flowers. Hardy Rhododendrons seldom flower profusely in consecutive years, but fine displays biennially are usually made. Established plants can take care of themselves, and in strong loamy soil artificial waterings are not required. In very dry summers mulching the roots of a few single plants that occupy a rather dry position is often necessary, but where the beds are on level ground they succeed without this attention. This is not so in all cases, as drought in the early autumn months often kills many of the large plants on shallow soils. Rhododendrons are, as a rule, safe from over-dryness at the root until August; then, if the weather should be dry, a good soaking of water twice a week and a mulch over the roots of half-rotten manure, 3 or 4 inches in thickness, will maintain them in health. Some degree of shade is helpful to Rhododendrons, all the more so in dry soils and in the districts with a slight rainfall. Marked progress has been made with hybrid Rhododendrons of recent years, such fine new kinds as Pink Pearl, White Pearl, Mrs E. C. Stirling, and others of a like class, having put many of the older kinds in the shade. These varieties are, however, still scarce, and likely for a while to remain so.